I see it as something of a mania, this affliction of the American Church with outing those we perceive as being wrong. Yes, doctrinal purity matters, but the ramifications of our calls for it are scary when we meditate on the words of Jesus. At the core, doctrinal purity is not so much the issue as is personal humility. And if we want to talk about humility, we need to start with the truth that we tend to judge others more harshly than we judge ourselves. A collective distortion exists in your mirror and mine. We have a tendency to always believe that we’re right and the other guy is wrong. As I’ve written many times before, it is a grave error to presume that we’ve arrived. Fact is, none of us got to a decently solid foundation of truth without holding erroneous views at some point along the journey of faith. Everyone has been wrong at some time or other. Perhaps we would all do ourselves a world of good if more of us assumed that we might even hold erroneous views/doctrines right now. I started this post with the words of Jesus, words I don’t think we take well to heart. Do we ever consider that when we hold out the title of heretic and attempt to pin it on another Christian that title may very well boomerang and wind up embedded in us? Do we stop to wonder if we’re exactly right on every part of the faith before we attempt to correct someone else’s perceived errors? Do we ever think that the more we judge the more we will end up judged? Do we ever ponder that when we deal with other possibly erroneous views (and the people who hold them) with love, it is love that will be applied to our own possibly erroneous views? The world today is a tediously judgmental place. It seems like everyone walks around ready to lay into another person, poised to spring the trap. And the level of disagreement has taken on insane dimensions, almost as if someone else’s love of the color indigo warrants the death penalty from those of us who may prefer aqua. It’s as if we have no understanding of the boomerang nature of judgment and love. Hurling the former comes as second nature, yet we’re caught off guard when we get konked in the head by the same standard we just hurled at someone else. And that love thing feels pretty foreign to us, so scant the amount we toss around. Funny thing is, tossing love actually feels pretty good when it boomerangs back on you and me. That we American Christians throw so little love may explain why many of us feel beaten to a bloody pulp. Thanks, Mike. You have a blessed day. I agree. I needed to hear this. 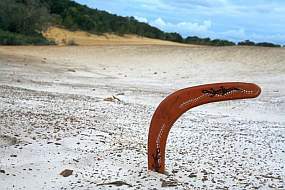 I love the picture of a boomerang – very powerful and very true. Would it be considered loving to shout at a stranger who’s walking on a path? But perhaps it’s the most loving thing we could do, if it’s a blind man who is heading towards a cliff. My experience has been that those who are most keen on practicing “tough love” are also the people who need a greater shot of personal reflection. They are also the most likely to not respond well when “tough love” is used on them. That’s my experience. YMMV. I wanted to add that I have no issues with warning people. But there are ways to do it that don’t involve throwing people under a bus. All too often, our default behavior is to rent the bus and start throwing. I believe that in almost every case there is a better way. I know this because I witnessed a man’s ministry that always found a way to draw people away from the cliff just by his extreme outpouring of genuine love expressed in a gentle way. Well if we have a foundation built on something that’s a contradiction to biblical truth, it should be torn down. Demo work can get a bit messy but in the long run, it’s better to have a correct foundation than one that will crumble under stress. If I was building a house I would appreciate a master builder’s help with laying out the foundation. It would be nice if he was kind, but I would take a his advice even if he was a grouch. In the long run I want a solid foundation. I read a quote of Spurgeon’s, who said after God disciplines a nation, he breaks the rod. I think it is also true of individuals. But it can be a sanctifying process; it will humble the reprover, and is an opportunity for the reproved to demonstrate humility–which you have demonstrated time and again–not many bloggers post unflattering emails, much less respond to them with the charity you displayed. Or answer thoughtfully, without sarcasm, the rants of those disenchanted with your theology. Good work. Thanks. Honestly, I can’t change anyone’s heart or mind. Only God does that. He makes all things beautiful in His time, and that goes for those times when we goof up. I don’t want to be part of spiritual one-upmanship. I see that a lot on the Web. I’ve grown tired of it. If I measure out love, I hope it will be measured back to me. I need to be careful when I measure out judgment, as I know that I must be solid in where I am. Fact is, I’m not solid in a lot of areas, so perhaps I can better spend my time working with the Lord on my own failings. He’ll take care of someone else’s failings sure enough. You’ve mentioned this “judgementalism” a few times now Dan but over here in the UK I’ve yet to experience it in the way you describe. In fact more the norm is take “do not judge lest you be judged” hewn out of context to retain an amicable confusion. That’s interesting. I think Europe, in general, probably swings more toward the direction you describe. The U.S. is definitely judgment-oriented, especially within evangelicalism. I really wishwould we could ease up and replace some of that judgment with greater love. I think we all need to come closer to the center. Your probably right about the geographical differences; I have very little experience of the American church. And yes we both ought to come to the centre.